April 14 — The corporate media may give it a different spin, but for Palin and Wall Street’s Tea Party, Boston was a bust. The day started with immediate tension as Bail Out the People Movement activists and the mostly Haitian-origin staff of Steelworkers Local 8751 unfurled their banner in the middle of the Tea Party’s rally here today. The banner read: “Union jobs & healthcare for all! Stop the pro-war, racist, sexist, anti-LGBT Palin/Tea Party attack!” At Boston’s Park Street subway station on Boston Common in the heart of downtown, the anti-racists were immediately surrounded by screaming white men, some wearing hardhats and carrying U.S. flags. Police dressed for battle looked on, smiling at the Tea Party gang. Steelworkers Local 8751 school bus drivers. Overcoming their hesitation, the anti-racists got out the bullhorns and took the racist forces on politically. They said that unions are in favor of free healthcare for all people and want a government-sponsored jobs program for all of our millions of unemployed sisters and brothers. Within minutes, passersby were stopping to say, “Right on!” Some asked for signs and joined us for awhile. The red-faced white guys with signs reading something about “Tread on me” gradually took off, muttering profanities. For 20 minutes the anti-racists took turns talking into the loudspeakers, telling the truth about the corporate-sponsored Tea Party. They told how Tea Party followers had spit on the Congressional Black Caucus in Washington, D.C., a few weeks ago, hurling racist epithets at Rep. John Lewis, a hero of the Civil Rights Movement. They told how Tea Party members vomited anti-gay invectives at Rep. Barney Frank. 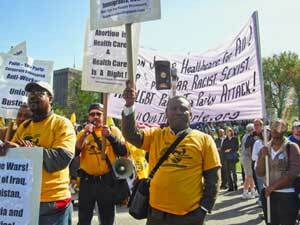 The anti-racists made it clear that what the union movement supports is government-sponsored healthcare for all people. It wants a massive program of job creation for public projects to put all people back to productive work to support their families. By then, their ranks had tripled. A young woman who’s been leading Friday night cypher youth discussions at the BOPM office showed up and took over the banner. Veterans for Peace activists joined with their flags. 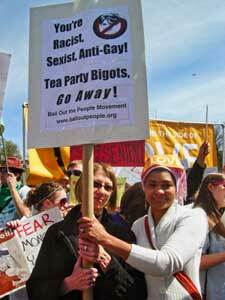 Some college students came with signs denouncing homophobia and Tea Party bigotry. It was hugs all around when a transgendered activist stopped on his way to the statehouse to demand transgender inclusion in anti-discrimination legislation. Thousands of thumbs-up and vocal support from folks on the street emboldened the group to march in the line of Tea Party dupes toward the stage. The multimillion-dollar, multimedia outdoor stage was surrounded by TV trucks and a police cordon. When the nearly 100 protesters reached the stage perimeter, anti-racist organizers hooked up a more powerful mobile sound unit and started a program of speakers and chanting. Special Operations police forces soon shut it down, with threats of arrests for permit violations and complaints that the Tea Party speakers couldn’t be heard over the noise. A young Asian woman activist from the Coalition for Equal, Quality Education urged protesters to march. They began moving through the outskirts of the crowd, discovering hundreds of people who had come to oppose the racists. The bullhorns went back on. The march began snaking through the lemonade and pretzel stands where people were selling hate literature, buttons and T-shirts at tables paid for by Wall Street contributions. Plenty of middle fingers, spittle-covered curses, shoves, blocks, taunts and ear-splitting whistles from red-faced haters greeted the anti-racists, whose numbers continued to swell. There were a few thousand in the Tea Party crowd, not the 10,000 to 20,000 predicted by Fox, Glenn Beck, Rush Limbaugh and the front page of the Boston Herald. Still, many Tea Party opponents stayed on the sidelines in silent protest, perhaps fearing the increasingly agitated and violent reactions of the Sarah Palin-inspired haters. The master of ceremonies announced Palin’s entrance for what was to be a vicious anti-immigrant speech. Just then, the marching protesters reached a critical, determined mass, and took a left into the crowd, pick-and-rolling around the police line, directly toward stage right. As Palin opened her vitriol, the people on the move chanted, “Racist, sexist, anti-gay, Palin/Tea Party go away!” while fending off punches, kicks, body blocks and other violence. Not 20 yards from the stage, completely surrounded by and face to face with screaming, violent Tea Partiers, the anti-racists were able to keep their formation moving and message blaring, with the people’s union security fending off the blows and pushing forward, until the bigots erupted with whistles and unison booing. Palin appeared dumbfounded, standing there for the longest time speechless and wide-eyed in front of the corporate media, perhaps gazing over the horizon to see Russia. The protestors fought their way back to the perimeter. There were hundreds of young women and lesbian, gay, bi and trans anti-Tea Party people in that part of the crowd. They cheered the marchers, who then started their own rally. People took turns on the bullhorns, supporting a woman’s right to choose, denouncing U.S. wars and occupations, and declaring homophobia a crime. 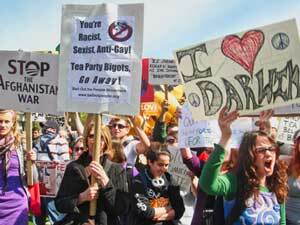 Others carried placards against the Afghan war, and a large blue banner reading “Tea Party = Racism” was on display. Protesters, who numbered in the hundreds, were visible throughout the crowd. The protest was a step forward for people ready to fight the capitalist system’s tricks, diversions and violent organizational maneuvers to maintain its dominance over the vast majority of the world’s working and oppressed peoples.